Sarah Benoit has worked in the web design, SEO, and social media fields since 2003 and has been teaching classes on related subjects since 2006. 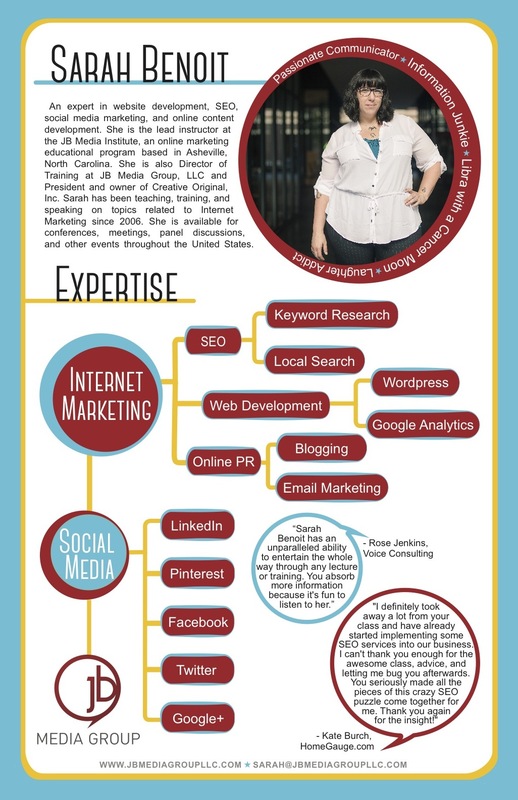 As President of Creative Original, she has built a wide variety of small business websites over the years. As Co-founder and Lead Instructor for the JB Media Institute, Sarah Benoit leverages her years of experience as a digital marketing strategist to create timely, relevant, and engaging training content. Sarah speaks, trains, and presents on digital marketing topics at conferences and events throughout the year in the Southeast and beyond. Sarah recently received the 2017 Woman Executive of the Year award from WomanUp at the Asheville Area Chamber of Commerce. She was inducted into Asheville’s 40 Under Forty in 2013 and is a graduate of Leadership Asheville. She is also a 2017 graduate of the Hive Global Leaders program. Sarah talks about the online JB Media Institute. I admire her ability to communicate and teach online marketing in a way that keeps it real. She brings it all home and answers the WHYs of what we do. Her best advice: know what you want your website to do first. Her main goal? Making the internet a better place.